Little did the scientists know that they had just been the first humans to ever set eyes on a living glass sponge reef. Scientists who studied the ancient fossil reefs likened this discovery to finding a herd of dinosaurs wandering around on land. 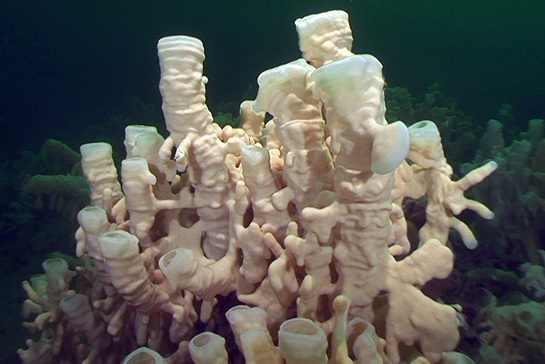 B.C’s glass sponge reefs provide a glimpse into ocean life from two hundred million years ago. Glass sponges are one of the oldest animals groups on earth, they first appeared more than 570 million years ago, long before the first fish and the first dinosaurs. The first glass sponge reefs were formed about 220 million years ago. The reefs would thrive in the prehistoric ocean for another 180 million years.2 They were in existence when the first dinosaur set foot on land and alive long after the last dinosaur had died. Then, about 40 million years ago, glass sponge reefs appeared to die out.2 Although individual glass sponges occur across the world’s oceans, no younger fossilized reefs were ever found. That is until living glass sponge reefs were discovered in Hecate Strait in 1987. Scientists have dated the Hecate Strait reefs to about 9,000 years old 1 ; they would have started to form just after the last ice age, so even these living reefs are ancient. Although individual glass sponges growing on rocks are known from all world oceans, glass sponge reefs are incredibly rare. The reefs form as one glass sponge grows on top of another glass sponge, but for some reason this behaviour is unique to certain areas. 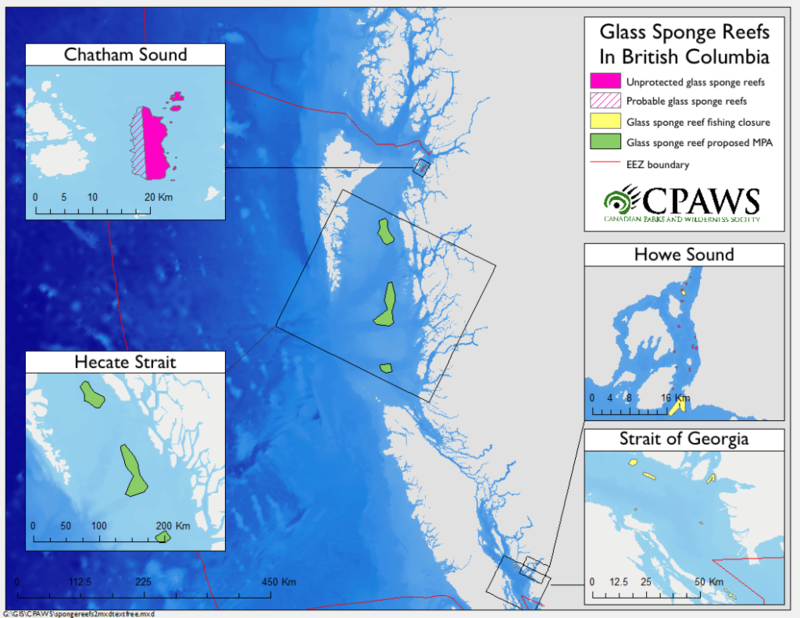 The Hecate Strait reefs are by far the largest living glass sponge reefs. In total they cover hundreds of square kilometers of seafloor and in some places reach the height of an eight-story building. 4 These “living dinosaurs” are built by three species: the finger goblet sponge (Heterochone calyx), the cloud sponge (Aphrocallistes vastus), and the fragile and cloud like Farrea occa 2 with translucent tissues about one millimeter thick. In 2001, nine more glass sponge reefs were discovered in the Strait of Georgia and Howe Sound, right on Vancouver’s doorstep! These reefs are much smaller than the Hecate Strait reefs; each reef covers no more than a few square kilometers. Another fourteen small reefs were discovered more recently in Howe Sound and in 2015 a large reef was discovered in Chatham Sound, near Prince Rupert. In 2018, two small reefs were discovered in the Broughton Archipelago. Sadly, one of these reefs had been smothered by waste from an open net-pen fish farm and was dead. Glass sponge reefs in different areas vary in the species of glass sponges, size and shape, and also host different species of marine animals that live in the reefs and depend on them for food and protection. Most of the known sponge reefs have not even been explored yet. The reefs that remain to be examined will have many surprising lessons for biologists and other scientists, maybe even a new species. It is almost certain that more reefs will be discovered in BC, along the wild and rugged fjords and inlets of British Columbia’s expansive and remote north and central coast. These undiscovered and unexplored areas offer an exciting opportunity to contribute to our understanding of these amazing reef systems.